The Global EV Road Trip is designed to introduce people to the idea of driving an electric car. This past week, it went through the United Arab Emirates and Oman. I spent one day this week driving a Tesla Model S 90D as part of the tour, and it is a beautiful automobile — sleek, fast, and comfortable. The front seats may be the best I have ever experienced. At the end of the day, the road trip entourage arrived at the fantastic new InterContinental Hotel on the Gulf of Oman in Fujairah, United Arab Emirates. The next day, I had an opportunity to meet with Ronald Balit, product communications manager for GM in Dubai. He introduced me to the Chevy Bolt, the battery electric car that will spearhead GM’s campaign to bring electric mobility to the Middle East. The Bolt is scheduled to go on sale in the UAE in 2019. This was my first opportunity to sit in and drive the Bolt and I came away impressed. Now, no one pretends the Bolt has the cachet of the Model S. It is not intended to. What it is meant to do is be a competent, full featured electric automobile for mainstream drivers. On that basis, the Bolt does very well. It sits higher off the ground than the Tesla Model S, which makes it easier to slide in and out of, especially the back seats. Anyone who says anything negative about a Tesla is likely to get some angry comments from people, but I found getting into and out of the back seat of the Tesla difficult. The low roof line and narrow door opening made it a challenge, at least for me. The Bolt doesn’t have the top speed or acceleration of the Tesla, but compared to the Honda Civics, Toyota Corollas, and Hyundai Elantras of the world — the mainstream cars that mainstream drivers buy lots and lots of — the Bolt has plenty of oomph. I know it is not as quick as the Tesla, but from behind the wheel, the difference is not readily apparent unless you make it so. Mash the go pedal and the acceleration is immediate and much more that those gasmobiles can muster. The Bolt also features regenerative braking, which makes one-pedal driving possible. After a few miles, the technique becomes second nature and you wonder why all cars don’t have it. With the coming EV revolution, it won’t be long before one-pedal driving is as ordinary as automatic transmissions and power steering. Ronald is a car guy through and through — a self-described petrol head. For a number of years, he was the editor of an Arabic-language magazine that focused on high-performance cars like the Chevy Corvette. He tells me that the “bowtie brand” has roots in the area that go back almost 100 years to when Chevrolet trucks were used to transport oil prospectors around the area. People here have an affinity for American V8 engines and rear-wheel drive. Chevrolet practically caused an armed insurrection when it shut down production of the full-size Caprice sedan two years ago. 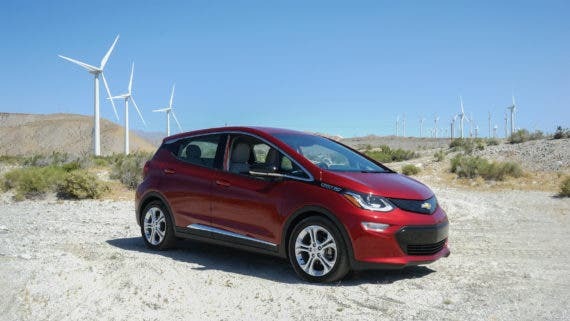 The brand loyalty built up over the years has gotten people excited about the Chevy Bolt and the other electric mobility products in the pipeline. Last November, CEO Mary Barra announced that the company would introduce at least 20 new vehicles with electric motors (that can mean hybrids, plug-in hybrids, fully battery-powered cars, or fuel cell vehicles) by 2021. Barra said all would be profitable — a not so indirect swipe at Tesla. Ronald proved to be a realist when it comes to the car market of the future. Chevrolet can’t rest on its laurels and expect its excellent reputation in the Middle East to sustain it forever. In the UAE, several Chinese brands — including GAC, BAIC, and Great Wall — are already selling their products. With China’s emphasis on electric cars, it won’t be long before those companies begin offering them to customers in the Middle East, which means Chevrolet will have to be on top of its game to implement its electric mobility strategy for the area successfully. Two CleanTechnica writers, Carolyn Fortuna and Steve Hanley, joined the Middle East Global EVRT 2018. CleanTechnica director Zach Shahan was also part of the launch event and joined the initial leg of the road trip briefly. This is one in a series of articles that resulted from the excursion.